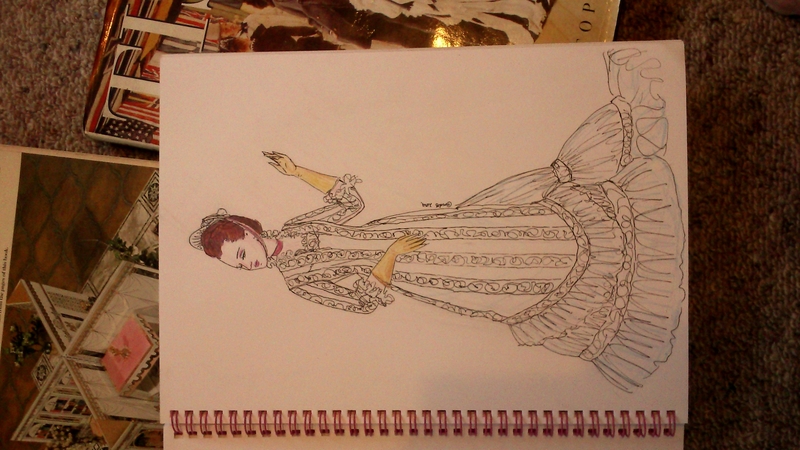 FIRST VICTORIAN SKETCH IN AGES! This will be cotton net and heavy guipure lace sewn in stripes. It will be a polonaise in the natural form style- so very long and quite tightly pulled back rather than up and back as you see in the two bustle styles. There will be a cotton sateen fitted princess slip underneath. And the sheer matching train will be sewn to the hem of the striped portion- the number of horizontal lace stripes will depend on how much i have of the lace. The net will have the lace sewn on in slightly flared lines then the fabric will be fitted with darts and seams. Previous Previous post: @BIOWARE @SWTOR YOU DONE GOOD! SHADOW OF REVAN AND TOGRUTA <3 !!!! !